HARVARD, WILLIAM MARTIN, Methodist minister; b. c. 1790 in England, probably in the London area; m. 23 Nov. 1813 Elizabeth Parks in London, and they had five sons, two of whom died in infancy; d. 15 Dec. 1857 in Richmond (London). William Martin Harvard was evidently trained as a printer. In 1810 he became a probationer for the ministry in the Wesleyan Methodist Conference and in 1813 volunteered to join the Reverend Thomas Coke and others in establishing Methodist missions in India and Ceylon (Sri Lanka). As a prospective foreign missionary Harvard was ordained in 1813 in London. Subsequently, Coke performed Harvard’s marriage ceremony. In December Coke and his companions sailed from Portsmouth on the long voyage to India, but Coke’s contributions to the missionary enterprise of the conference ended when he died at sea. Harvard conducted the funeral service, and the party proceeded to its destination. He remained in the India–Ceylon mission until 1819 when ill health forced his return to England. His well-written but discursive account of the inception and growth of the mission to India was published in 1823, the year his wife died. Harvard regained his health at home, and between 1819 and 1835 he was stationed on several circuits in southern England. In 1836 he was appointed president of the Canadian conference, an office he held until 1838, and chairman of the Lower Canada District. He arrived in Montreal on 16 October and immediately assumed his duties there. A year later he moved to Toronto. John Saltkill Carroll* described him as “commanding in person, almost the fac simile of General Washington; dignified in his carriage; polite in his manners; pre-eminently Christian in his spirit; and unusually faithful as a minister.” At first he impressed the Canadian ministers much more favourably than had his predecessor, the Reverend William Lord. Harvard’s appointment as president came at an unpropitious juncture in the relationship between the English and Canadian conferences. The two had united in 1833 to form the Wesleyan Methodist Church in Canada. In the mean time, in England, the Wesleyan Methodist Conference had come to be defined as a church, with a ministry ordained by the imposition of hands, whose authority could not be shared with local preachers or class leaders, and in which the conference was sovereign. The church’s leaders accepted the established church and were intensely hostile to those – usually the same persons – who promoted disestablishment and radical politics. Harvard evidently shared these views and was slow to learn that the conference in Upper Canada was not wholly of the same mind. By 1836 some members of the latter conference were becoming disillusioned with the union. Two years earlier the union had precipitated a secession led by disgruntled local preachers who established a new organization, the Methodist Episcopal Church in Canada. Within the conference, the Wesleyan sympathizers urged that the Christian Guardian become a solely religious journal, supportive if necessary of the political status quo, and that the conference accept a share of the clergy reserves income, were a division of the reserves to occur. The Canadian leaders, and probably the majority of their followers, were dubious at best, or outright opposed to the Wesleyans’ position. As for Harvard, in a letter to the Reverend Robert Alder* in January 1837, he commented that the Methodists could use a share of the clergy reserves for chapels, schools, and parsonages. “The Scotch people,” he wrote to the Reverend Egerton Ryerson* in May, “are making a grand effort for the clergy reserves. We might find a slice of the loaf highly helpful for our Parsonage houses, Supernumerary Preachers, and students for the ministry at Cobourg. . . . I should be unutterably vexed to be disinherited of our just ground of expectation.” Harvard doubtless had some part in framing the equivocal resolutions adopted by the conference in 1837, in which the exclusive claims of Anglicans and Presbyterians were condemned and the conference’s willingness to accept a share of the reserves “for the religious and educational improvement of the Province” was indicated. Not surprisingly, he continued to press for the payment of the government grant to the Wesleyan Methodist Missionary Society. Harvard would provide confirmation of this assessment with the publication the next month in the Guardian of a pastoral letter to the ministers in Upper Canada of the Wesleyan Methodist Church. Having learned that there were Methodists who had “not done honour to their Christian profession, during the late unnatural rebellion,” he thought it imperative to state that “some opinions . . . so involve the very vitals of morality as that they are never found associated in the same bosom with fervent piety and deep devotedness to God.” In “a question of loyalty to the Sovereign of an Empire, the Government may well say, in the words of our adorable Saviour, ‘He that is not with me is against me.’” Thus he instructed the district chairmen to require every minister to scrutinize the loyalty of all members. “Should there be a single individual, for whose Christian loyalty the Preacher cannot conscientiously answer to his brethren, . . . such individual should be dealt with, kindly and compassionately, but firmly, according to the provisions of the Book of Discipline.” He reminded his brethren that in Britain the Methodists were known for their “faithful attachment” to the crown. Undaunted, Harvard asked Ryerson, “How can we keep our Methodist stage from going deeply again into Radical mud . . . but to keep well off from the ditch while we turn this corner?” Harvard wished “to see Canadian Wesleyan Methodism become more and more Wesleyan, and this will make it the glory of the land. It appears to me that to Americanize it will be to neutralize it.” He presided with equanimity at the conference in June 1838. Many there, however, must have shared John Ryerson’s opinion that “Mr. Harvard [is] a very dangerous man. . . . You would be surprised to see how he has been runing about [Toronto], fawning, bowing, smiling, eulogizing, flattering, etc. . . . to make proselites to himself & Mr. Evans.” No doubt they were relieved to learn that the missionary society had decided already to station him in Quebec. Harvard remained in the Lower Canada District until 1845, acting as chairman throughout that period. 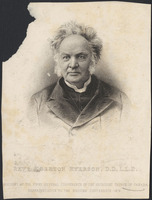 In the latter year he returned to Toronto as chairman of the Canada Western District which had been created after the dissolution of the union between the Wesleyan and Canadian conferences in 1840. During his tenure in Toronto as chairman, an appointment proposed by the Reverend Matthew Richey*, his role became that of helping persuade his recalcitrant brethren to accept the reunion of the two conferences in 1847. This must have been a difficult task, for he was not alone in considering the disruption of 1840 “a providential opening” for the establishment of a truly Wesleyan connection in Upper Canada. Throughout the pre-union negotiation, he urged that the Wesleyans and the Canadian Methodists should go their separate ways and “agree to differ.” Reunion should be effected only on condition that the British conference secured supreme control over the Canadian conference. In the end the Wesleyans settled for less than Harvard thought wise, but he worked loyally with Alder to bring the Canada Western District into line. Clearly, however, his usefulness was at an end and in 1847 he was assigned to the Maidstone circuit in England. At home, Harvard was appointed in succession to the Maidstone, Portsmouth, and Norwich circuits, and finally in 1855 he became house governor of the southern branch of the Wesleyan Theological Institution, in Richmond. He died in office in 1857, after experiencing a time of turmoil in the English conference over the status to be assigned to ordained ministers. Harvard’s brethren recorded that “his character was distinguished by lowliness and sanctity . . . . He was faithful in the exercise of his ministry; ‘gentle’ among the churches . . . esteemed and beloved by a multitude on both sides of the Atlantic.” He epitomized much of the Wesleyan Methodism of his generation in his conviction that its polity, missionary zeal, loyalty to British institutions, and conservatism made it a form of Methodism superior to all others. His kindly temper and courtesy enabled him to persuade many that the unadventurous Methodism he proclaimed was the one most likely to succeed in his time. William Martin Harvard’s writings include The Gospel warning: a sermon occasioned by the death of Private J. Jenny . . . (London, 1818); The faith of departed saints: an unperishable monument of instruction and admonition to survivors; a funeral sermon, occasioned by the lamented death of his late most gracious majesty, George III, of religious and blessed memory, preached at the Wesleyan Methodist Chapel, Duke Street, Deal, on Wednesday, Feb. 16, 1820, being the day appointed for the interment of his late majesty (Deal, Eng., 1820); A narrative of the establishment and progress of the mission to Ceylon and India, founded by the late Rev. Thomas Coke, L.L.D., under the direction of the Wesleyan-Methodist Conference . . . (London, 1823); The substance of a funeral sermon, delivered in the Wesleyan Chapel, St. James Street, Montreal, on Sunday, August 13, 1837, on occasion of the lamented demise of his most gracious majesty, William the Fourth (Montreal, 1837); Remarks and suggestions, respectfully offered, on that portion of the clergy reserve property, (landed and funded,) of Upper Canada, “not specifically appropriated to any particular church”; in a letter addressed to His Excellency Sir George Arthur, K. C.B ., governor, and commander-in-chief . . . (Quebec, 1838; 2nd ed., 1839); Defence of protracted meetings: special efforts for the souls of men justified, and observers of such efforts admonished, in a discourse delivered in St. Ann Street Chapel, Quebec, a second edition of which, published at London and Quebec during the 1840s, is available at the UCA; No honesty separate from veracity; the unrighteous monopoly, (by an intolerant party in the Church of England,) of “whatever Christian knowledge Canada possesses,” examined, exposed, and rebuked; to which is added: a defence of the Wesleyan Methodists, and other orthodox churches in Canada, against the “unchristian bitterness,” “violent dealing,” and misrepresentation, of the theological professor of M’Gill College, Montreal (Montreal, 1845); Facts against falsehood: the false allegations . . . made by the “Christian Guardian,” (the official organ of the Upper Canada Conference,) against the missionaries of the British Wesleyan Conference, in Western Canada . . . fully and forcibly disproved . . . (Toronto, 1846; copy at UCA); and Five defensive letters in behalf of the British Wesleyan Conference and their missionary society . . . against the attacks of the Canada Conference Journal (Toronto, 1846). He is also the author of Memoirs of Mrs. Elizabeth Harvard, late of the Wesleyan mission to Ceylon and India; with extracts from her diary and correspondence, a biography of his wife prepared following her death in 1823; a copy of the 3rd edition (London, 1833) is at the UCA. SOAS, Methodist Missionary Soc. Arch., Wesleyan Methodist Missionary Soc., corr.., North America, 1837–47 (mfm. at UCA). Jabez Bunting, Early Victorian Methodism: the correspondence of Jabez Bunting, 1830–1858, ed. W. R. Ward (Oxford and New York, 1976). Wesleyan Methodist Church, Minutes of the conferences (London), 5 (1819–24): 102; 8 (1836–39): 47; 10 (1844–47): 198, 466; 13 (1855–57): 26; 14 (1858–62): 8–9. Wesleyan Methodist Church in Canada, The minutes of the annual conferences . . . from 1824 to 1845 . . . (Toronto, 1846), 168. Wesleyan-Methodist Magazine (London), 42 (1819): 714; 60 (1837): 72. Christian Guardian, 30 Nov. 1836; 15 Nov. 1837; 18, 25 April, 9 May 1838. Cornish, Cyclopædia of Methodism. Carroll, Case and his cotemporaries, 4: 131. French, Parsons & politics. J. E. Sanderson, The first century of Methodism in Canada (2v., Toronto, 1908–10), 1: 390–91, 393, 398, 404, 413, 420. C. B. Sissons, Egerton Ryerson: his life and letters (2v., Toronto, 1937–47), 1: 379, 433, 471, 473. G. S. French, “HARVARD, WILLIAM MARTIN,” in Dictionary of Canadian Biography, vol. 8, University of Toronto/Université Laval, 2003–, accessed April 26, 2019, http://www.biographi.ca/en/bio/harvard_william_martin_8E.html.